Normally magnetic circuit calculations involve two types of problems. In the first type of problem it is required to determine the excitation (mmf) needed to establish a desired flux or flux density at a given point in a magnetic circuit. This is the normal case in designing electromechanical devices and is a straight forward problem. In the second category the flux (or flux density) is unknown and is required to be determined for a. given geometry of the magnetic circuit and specified mmf. 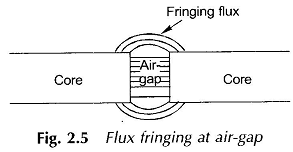 This kind of problem arises in magnetic amplifiers wherein this resultant flux is required to be determined owing to the given excitation on one or more control windings. A little thought will reveal that there is no direct analytical solution to this problem because of the non-linear B-H characteristic of the magnetic material. Graphical/ numerical techniques have to be used in obtaining the solution of this problem. In all practical Magnetic Circuit Calculations, most of the flux is confined to the intended path by use of magnetic cores but a small amount of flux always leaks through the surrounding air. This stray flux as already stated is called the leakage flux. Leakage is characteristic of all magnetic circuits and can never be fully eliminated. Calculations concerning the main Magnetic Circuit Calculations are usually carried out with the effect of leakage flux either ignored or empirically accounted for. Special studies of leakage must be made for ac machines and transformers since their performance is affected by it. which will be less than the previous value as Ag > A. It can be shown theoretically that the magnetic flux leaves and enters the surface of an infinitely permeable material normally. This will be nearly so in ferromagnetic materials which have high permeability. In electric machines a small amount of the tangential flux component present at iron surfaces will be neglected. Magnetic cores are made up of thin, lightly insulated (coating of varnish) laminations to reduce power loss in cores due to the eddy-current phenomenon. As a result, the net cross-sectional area of the core occupied by the magnetic material is less than its gross cross-section; their ratio (less than unity) being known as the stacking factor. Depending upon the thickness of laminations, stacking factor may vary from 0.5-0.95, approaching unity as the lamination thickness increases.